Jules Dassin’s prototype for the modern police procedural, The Naked City opens with breath taking aerial shots of New York, the gleaming beacon of modernity waving its skyscraper fingers at a devastated Europe after World War 2. These shots work best when juxtaposed next to the silent footage of Berlin’s corpse, punished from the air and the ground for a tyrant’s catastrophic hubris. Mile upon mile of rubble unfolds before our eyes without ever seeing one of the city’s survivors. In stark contrast New York teems with people, some good, some bad, some broken by the war, some made into the heroes America thought it deserved to return to its shores. If Hitler had been a New Yorker he wouldn’t have had to make his grand models with Albert Speer and turn his dreams into the world’s nightmares. He could simply step out of his home and look up at the Empire State Building, content in the fact that they had already been realised. “This is the city as it is,” states the omnipotent narrator voiced by Mark Hellinger. How apt that the film’s producer performs the commentary, only one rung down the ladder from godhood, but mortal all the same as Hellinger would die from a heart attack only weeks after viewing the final cut of the movie. This cruel irony soaks into the rest of the picture like rain soaking a newspaper in the gutter as native New Yorker Hellinger looks down from the heavens on the eight millions souls who traverse his beloved city. Hellinger zeroes in on one story, the murder of ex-model and party girl Jean Dexter, knocked out by chloroform and drowned in her bath. Her terrible death is intercut with a montage of mundane shots that reveal the banal functionality of a city at work, one that will grind on regardless of personal tragedy. Hellinger was pals with gangsters Dutch Schultz and Legs Diamond as well as the gossip columnist and radio personality Walter Winchel, and Dexter’s tale, just one of, “Eight million stories in the naked city” could have been lifted from his own experience. 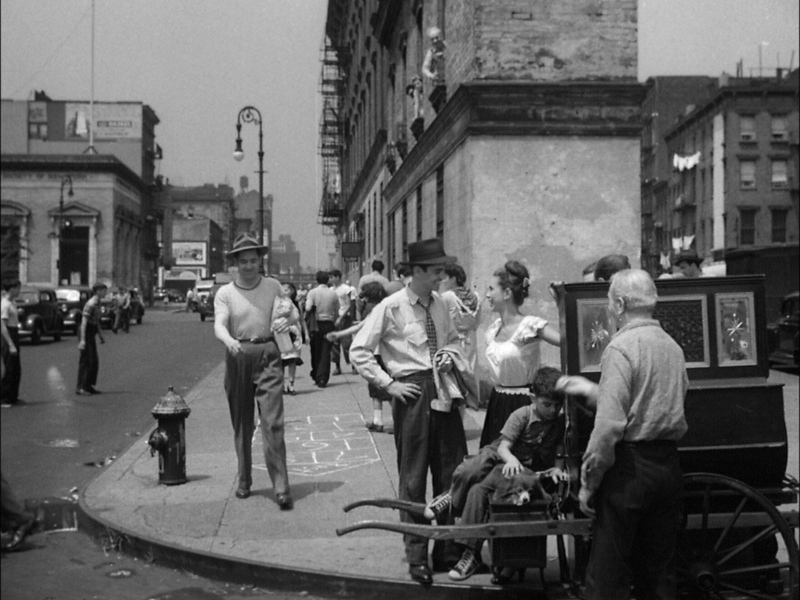 The Naked City’s remarkable visual style, shot largely on location in New York is a mixture of Italian neorealist films like Rome Open City and The Bicycle Thieves and the street photography of the celebrated New York snapper Weegee. Weegee’s 1945 book Naked City was a huge influence on the film noir exteriors and he was hired as a visual consultant. As the murder investigation kicks in we see the multitude of interconnected services deployed to take care of a single body from the ambulance to the coroner to the homicide squad, something Weegee’s own photos highlighted in such dramatic fashion. Later in the climax at the Williamsburg Bridge we see again the gritty realism location shooting can offer. A body requires a detective of course and The Naked City has the diminutive Lt. Muldoon, a 22-year veteran of the homicide squad. Muldoon cracks those quiet gags at everyone else’s expense but knows his business. He’s a modern cop with a forensic eye for detail. Muldoon’s junior partner Jimmy Halloran fought in the war and one must wonder which one of them have seen the most dead bodies? Halloran is a straight nosed, earnest, affable type, adverse to giving his son a whipping but happy to do most of the legwork, criss-crossing a bustling New York after dead end leads and scraps of evidence. Muldoon’s sarcastic professionalism and Halloran’s stoic war hero persona prove an interesting insight into the treatment of soldiers returning from overseas and typical film noir tropes. Muldoon is exempt from ridicule due to his age and important job whereas Halloran has found his place in the new world order, no femme fatale or murky situation for him to face just a loving wife and a new role that benefits society. In contrast murder suspect Frank Niles lies about his service claiming he was a Captain in the Pacific theatre, ashamed at dodging the bullets. Perhaps if he had fought the Japanese then presumably he would have stayed away from his nefarious activities, live or dead. This harsh reality is brutally executed by Dassin in the closing montage as he focuses on the forlorn faces of those left behind to deal with the aftermath of the tragedy but before the audience can fully grieve he tempts us, like Jean Dexter, with the neon lights of The Big Apple again. How quickly we forget when we’re dazzled, but Jean was only one girl in a city of millions and New York only one city out of thousands in the world. Why should we care about this story in particular when millions perished for something far greater than their own petty greed and wealth? Probably because that’s what the movies are for.